DISCOUNTED through Thurs April 18th, 2019! 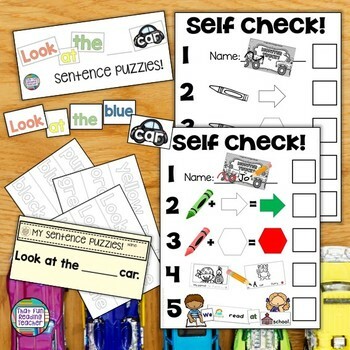 Look at the Cars is a fun, colorful Sight-Word Stages Emergent reader (featuring the words ‘look’, ‘at’ and ‘the’)! This Level A car-themed set was written with early readers in mind. 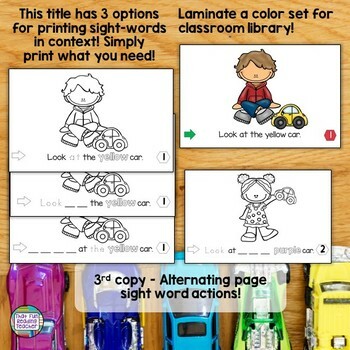 With directional reminders in the bottom corners of each page, and the option to use the color or one of the three black and white options provided, you can differentiate Sight-Word-Stages readers just by printing! Students can color a black and white copy with 'at' in a dotted font to (trace just the one small word), read and take home. A combination of the dotted font and blank spaces for students to fill in the missing sight word are used for the second and third versions, with increasing levels of challenge (please see images above for more detail). 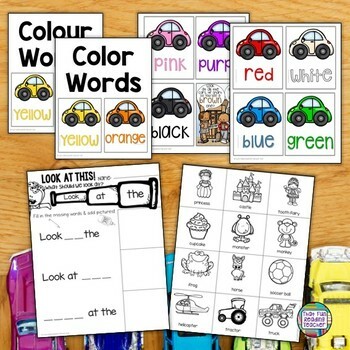 This set includes color words visuals, ideal for your writing center! Try a free sample of the SWS stories! Thank you in advance, to those of you who generously take the time to leave feedback here. (And give yourself a little pat on the back, too - you will have just topped up your TpT credit balance! ♦Levels A/ B – 10 pack: Sight-Word Readers, sentence puzzles and more! ♦Level A (+1 Lv A/B) – 5 pack: Sight-Word Readers, sentence puzzles and more! ♦Concepts about Print: Letters and Words Storybook Lesson, bulletin board, visuals and sorting activity! 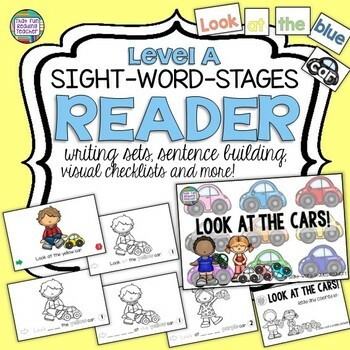 ♦Level aa Special Times of Year – 10 pack: Sight-Word Readers, sentence puzzles and more! ♦FREE Elkonin sound boxes and syllable printables like those included in Read and Write and More, sets! ♦Free K-2 Graphic Organizer and drawing printable (Earth Day)! ♦The Complete Personal Printable Alphabet Book Kit with over 200 Line Art Images! Please direct any questions you may have on the Q and A page of my store (by clicking my name at the top right), or email me at ThatFunReadingTeacher@gmail.com. • Log in and go to your My Purchases page. Click the Provide Feedback button, where you will be linked to the page to leave a rating and short comment for the product. • Look for the green star near the top of any page within my store and click it to become a follower. You will then receive email updates about ThatFunReadingTeacher on TpT!